Armstrong on bridge at office. 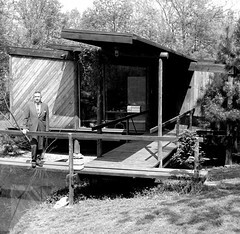 Armstrong standing on the bridge to his architectural office. This photograph was most likely taken in the 1950s. Toward the left, the bridge crosses over the pond and toward the right where it meets the ground, it connects to a path leading up to the Armstrong Residence at #3 Sappington Spur. Note the mailbox custom fabricated with Armstrong's new logo designed by Peter Geist. The cantilevered entry canopy leading to the entry is an Armstrong signature. He would often extend such canopies to visually indicate to visitors where the entry was located, to provide protection from the elements, and to protect the glazing around the entry from intense sunlight.